AKIPRESS.COM - In 2017, the EDB member economies adapted to negative external developments and embarked onto a trajectory of economic growth. The authors of the review note that the EDB countries have demonstrated positive growth rates due to improved external developments, the gradual softening of their monetary policies, and fiscal incentives. As at the end of 2017, the region’s GDP grew by 1.8%, compared to a decline of 0.1% in 2016, EDB said. Mutual trade is recovering, too. In January-November 2017, trade between the Eurasian Economic Union’s (EAEU) countries totalled US $48.8 billion, or 126.4% of the figure recorded in the same period of the previous year. Monetary policy is also demonstrating certain success. In December, the year-on-year inflation rates reached a record low of 4.6% in Belarus and 2.5% in Russia. In other countries of the region, they did not exceed the set targets. EDB analysts forecast positive economic growth in the Bank’s member states and a 2.2% increase in the region’s GDPs in 2018. In Armenia GDP is expected to rise by 3%, Belarus 2.6%, Kazakhstan 3.7%, Kyrgyzstan 4.2%, Russia 2%, and Tajikistan 7.3%. The record-low inflation rate achieved in 2017 (an average of around 3% for the region) is forecast to increase to 4% in 2018 but will remain within the targets set by the central/national banks. In Armenia inflation is expected at a level of 3.4% (year-on-year in December), Belarus 6%, Kazakhstan 5.8%, Kyrgyzstan 4.7%, Russia 3.8%, and Tajikistan 6.1%. 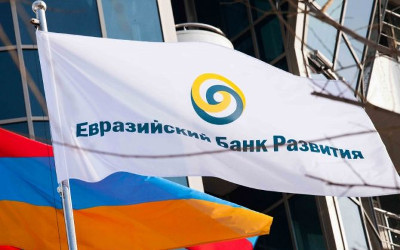 “An efficient application of fiscal rules should help to lessen the nominal exchange rate’s dependence on oil prices in the region’s leading economies and stabilise mutual exchange rates of the EDB member countries,” Yaroslav Lissovolik, Chief Economist at the EDB, comments. A special report attached to The Macroeconomic Review describes mutual trade between the EAEU countries, pointing out to increases in its nominal volumes, greater diversification of its structure, and a lower percentage of transactions in mineral resources in overall trade volumes. According to the authors, all these trends suggest that the single market in goods and services within the EAEU begins to bring economic dividends. At the same time, the impetus to economic cooperation given by integration is focused, among other things, on the development of intra-sectoral trade, which should make it one of the drivers of economic growth in the region.